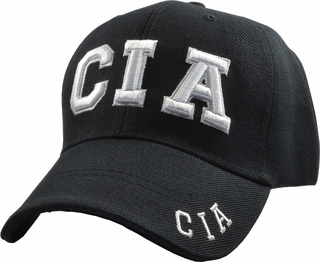 Show your support or affiliation with this slick simple Central Intelligence Agency black CIA embroidered baseball cap. C I A is embroidered in large white bold letters on the front of the cap with a smaller embroidered CIA on the bill and a printed CIA on the back velcro adjustable strap. This hat is one size fits all, 20% Wool & 80% Acrylic.